My “thing with the statue” all started a few years back. Actually, it started hundreds of years ago with human trafficking, genocide, and the systematic grand-scale enslavement of human beings that made the prosperity of early America possible. But for the purposes of this story, it began around 2009. 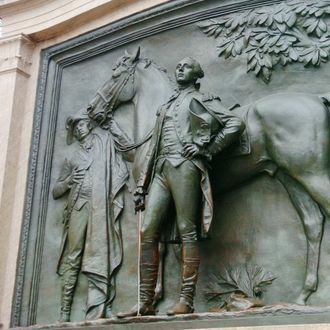 I was walking into Prospect Park, at the 9th Street entrance, when I noticed that the monument to the Marquis de Lafayette had, as part of its backdrop relief, an African-American-looking groomsman standing next to a horse. I thought to myself, I wonder who he was? Lafayette and his horse. His horse. Nary a mention of the grown man standing there, blanket over his shoulder and a look on his face like he’d rather be someplace else. I was perplexed, and then angry, and then curious. I went to the library. The statue, by Daniel Chester French, had been commissioned when a Frenchman turned Brooklynite named Henry Harteau died and left the city $35,000 to cast a monument to his celebrated countryman. (Lafayette and Harteau are identified on the statue’s base, and it was dedicated in 1917.) He asked that the statue be based on a painting called Lafayette at Yorktown by Jean-Baptiste Le Paon. The painting was actually of two men named Lafayette; one was the familiar marquis, and the other was named James Armistead Lafayette. The marquis was white and James was black. Still, I wondered: Were they brothers? Why did they share a last name? It turns out that James Armistead was an enslaved man from Virginia who enlisted to fight against the British and ended up working as a double agent. The information he acquired helped to win the battle of Yorktown; hence, the heroic painting. He served under Lafayette, and the two men became such close friends that the marquis successfully petitioned to have James made a free man, after James’s own request for manumission was denied. (Apparently, they were only freeing “slave-soldiers” who fought in the war; being a “slave-spy” didn’t qualify.) James Armistead then took the name of his friend out of affection and gratitude. He lived a long life and become a farmer and a family man. Black History Month ends today. So far, James and I are still waiting.